Amy E. Caruso Brown, MD, MSc, MSCS, is an Assistant Professor of Bioethics and Humanities and Pediatrics. She holds degrees from the University of Virginia (BA, 2002), Emory University (MD, 2008), the University of Oxford (MSc, 2008), and the University of Colorado (MSCS, 2014). She completed residency training in general pediatrics (Children's Hospital of Philadelphia, 2008-2009; University of Colorado, 2009-2011) and fellowship training in pediatric hematology/oncology (University of Colorado, 2011-2014) and is board-certified in general pediatrics and pediatric hematology/oncology. Dr. Caruso Brown is the co-director of Patients to Populations: Ethics, Law and Population Health, a required course for first-year medical students, and also teaches in the Center's Physicians and Social Responsibility elective courses and in the Clinical Bioethics Clerkship for third-year medical students. She serves on the College of Medicine Curriculum Committee and on the Upstate Institutional Review Board. 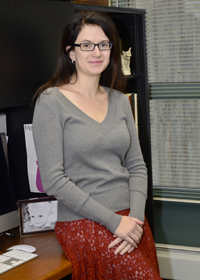 Her current research interests include cultural dimensions of treatment refusal in pediatrics; the impact of social media on trust and communication between physicians and families; and to developing innovative approaches to teaching and to evaluating teaching in bioethics and social determinants of health. In the context of her teaching efforts, she is particularly interested in the question of how medical students understand and enact social responsibility as part of their evolving professional identities, across societies and healthcare systems. Dr. Caruso Brown is also a member of the Ethics Consultation Service and treats patients at the Center for Children's Cancer and Blood Disorders and at Golisano Children's Hospital. Caruso Brown AE, Slutzky AR. Refusal of treatment of childhood cancer: A systematic review. Pediatrics 2017;140(6):e20171951. PMID: 29146622 DOI: 10.1542/peds.2017-19514. Caruso Brown AE. Choosing to care for children who might die: Conversations with pediatric residents. Perspectives in Biology and Medicine 2017;60(2):247-257. Caruso Brown AE. Reconsidering refusal: Are some cases refractory even to the best tools? American Journal of Bioethics. 2018; 18(8):61-63. PMID: 30133387 DOI:10.1080/15265161.2018.1485771. Caruso Brown AE. Finding faith in skepticism and symbolism in science. Narrative Inquiry in Bioethics 2016;6(3):159-161. Caruso Brown AE, Hobart TR, Morrow CB, eds. Bioethics, Public Health, and the Social Sciences for Medical Students and Professionals: An Integrated, Case-Based Approach. Springer, forthcoming. Last Modified: January 08, 2019. Contact Jessica Barbuto with questions about the content of this page.